In my earlier childhood days, my parents, brother and I lived with my maternal grandmother ("Por Por" as I used to call her). She owned a rather large house and therefore, had plenty of room for us. My parents didn't explain why we moved in with her but I'm assuming it was so that she could help care for my brother because they were both working. My mom was a career-minded woman and owned a small computer business so she kept long hours at the office, as did my dad who held a government position at the time. Because of my mom's hectic schedule, she was unable to cook so that was left to my grandma who happened to love cooking. All the nostalgia involving home cooked meals when I was a kid comes from the dishes that my grandma prepared for us on a daily basis. Being Cantonese, my grandma made alot of clear soups. A typical dinner would consist of one soup dish, one meat dish and one vegetable dish, sometimes two. I loved all the soups she made and really looked forward to dinner because of it. A flavorful, yet light Chinese soup brings such great comfort to me. When I make it now, it brings back so many memories of my grandma. Alas, she's no longer with us but my connection with her and the recollection of her remains strong through cooking the same dishes. The beauty of clear Chinese soups is its simplicity. 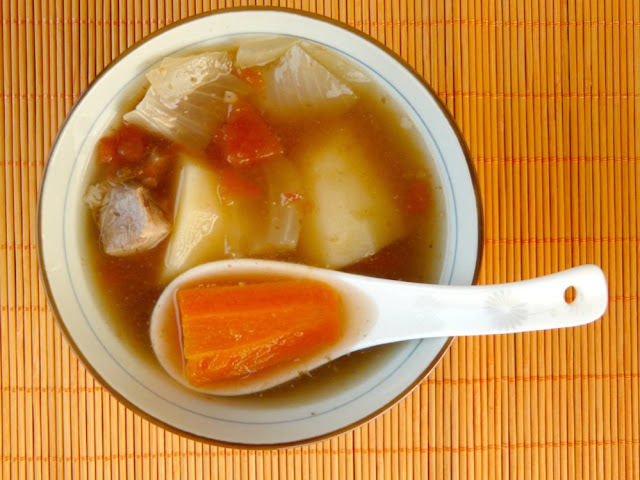 The flavor of the soup comes from slowly simmering either pork or chicken bones with certain vegetables. In some soups, Chinese herbs, dried fruit, dried oysters, scallops or cuttlefish are also used. My grandma made a wide variety of soups including yellow melon, winter melon, watercress and lotus root. She also made a very simple soup with root vegetables which, to this day, remains as one of my absolute favorite soups. I always used to have seconds whenever she made this soup and I think it has great kid appeal too because it has potatoes and carrots in it and not regarded as strange as say, watercress or lotus root. I've adapted the recipe slightly with the addition of whole peppercorns as it gives it just a little more zing but you can leave it out if you don't have any or prefer to keep it as simple as possible. You can slow simmer the soup on the stove top or in a slow cooker. If using the stove top method, the soup should be cooked over very low heat, the lowest possible. 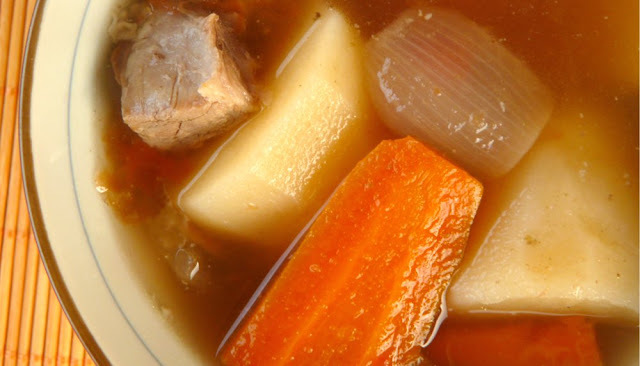 The soup should be simmered over the course of 3 hours, until the meat becomes fall-off-the-bone tender and the root vegetables become soft. When I cook soups or stews with pork ribs or pork bones, I always parboil them to remove impurities, blood and other...gunk. To parboil, simply bring a pot of water to a rolling boil, drop the bones into it and boil them for about 5 to 10 minutes. Drain the water, rinse the bones to remove any foam or fat, then return the meat to the pot and add 8 cups of fresh water. Bring the water to a boil again then add the onion, potatoes, tomatoes, carrots and peppercorns. Reduce heat to low (as low as possible, roughly 200 degrees Fahrenheit) then cover with a lid. Slow simmer for about 3 hours or so. Add salt to taste before serving.